Authors Paula Stern Election Results: The Same Idiots? Election Results: The Same Idiots? Moments after the polls closed: the pollsters did it yet again. They made their calculations and then made the results known. To be honest, all the votes have still not come in but a general direction is there. And…well, the pollsters only made a tiny error. Most said that Kachol Lavan would get 37 seats and Likud, led by Benjamin Netanyahu, would get 36 (or 33). One little error. As of this morning, based not on “exit polls” but on a majority of the real votes counted, the results were quite different. Ironically, it was Benjamin Netanyahu with 37 and Kachol Lavan with 36. The Embarrassment of the Night Award goes to Benny Gantz for arrogantly crowning himself as Prime Minister and thanking Benjamin Netanyahu for his past service to the nation. Oops. So a short while ago, I went to check the results and how others are reacting. Many of my friends, leaning to the right or solidly on the right as I am, were ecstatic. And then I noticed one man complaining that he just doesn’t understand. He asked a question and I offered a response. Israel is literally the definition of insanity. Choosing the same idiots who only represent themselves over and over expecting different results. So let me explain, as someone who didn’t vote for Bibi but is totally okay with the results of the election…even satisfied with them and more. I don’t think Benjamin Netanyahu is an idiot. I don’t think Benny Gantz is an idiot, nor Gabi Ashkenazi…I do think Yair Lapid is an idiot, but never mind – I didn’t write that during the whole election, so let’s pretend I didn’t write it now. Israel has a thriving economy. We have a strong military. The people are happy and healthy – according to international ratings that are not influenced by local politics. We are recognized as among the most innovative countries in the world. Adventurous in youth, on the battlefield, in innovation and more. Life is good here…even great. Our values are better than most, not worse than many (some would even say any, but I won’t here). The weather is great. We work too hard, that’s true. Our roads are okay – they could be better, but we’re working on that. We are a caring, loving, embracing society always, really always trying to be better. They aren’t idiots. They are our representatives and as we do after every election, some will smile and some will shake their heads. We’ll drink our coffee this morning (those who do…I don’t), and go to work. And we’ll complain, and gripe about this or that…just like we did last week or last month. But really, look around the world and then look around you here. And finally, after last night, you can no longer claim they don’t represent us, that they don’t stand for us. They most definitely do. That’s what the election was about. Reminding us all that our leaders are a reflection of our society, representatives, our voice. We have, apparently, given Benjamin Netanyahu the right to represent us and speak for us. Personally, I’d rather have him do it than Benny Gantz. But either way, Israelis were faced with an amazing choice. Two men who have spent their lives serving Israel in one way or another. Two men who spent years of their lives physically protecting this land. 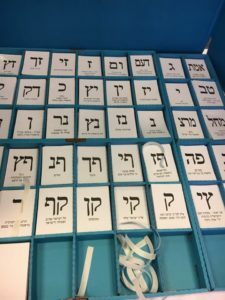 As of a short time ago, as the final votes are being tallied, it seems to have settled at 35 seats each, with a clear path for only Benjamin Netanyahu to form the next government. Meanwhile, Israel is preparing for the coming holiday next week. It celebrates the moment we became a free nation, no longer enslaved. And this week, just ahead of Passover, we expressed that freedom by electing (in this case re-electing) our leaders.